Lauren Liner and Sean Suire are that couple in your neighborhood that are always having fun cooking something outside on the weekends and selflessly inviting you and yours over for a taste. The self-proclaimed “natural hosts” seem somewhat surprised to find themselves at the helm of a restaurant, but the role suits them. Years ago, their former residence in the Saint Streets became a venue for Bar-B-Ques and Boils that are now the stuff of legend. Their gushing hospitality has even taken the form of grilling oysters guerrilla style in the since removed roundabouts of that neighborhood and offering them to passing motorists, and while officialdom lacked appreciation of these antics, it’s doubtful anyone complained. 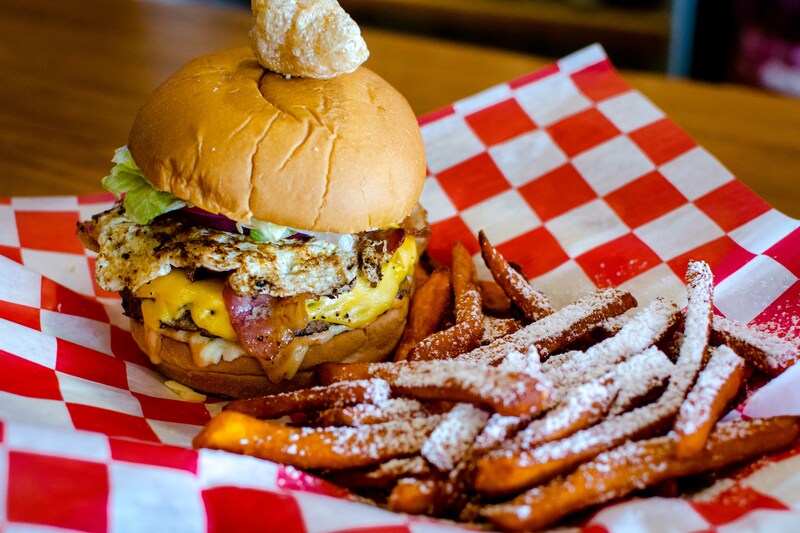 As the food truck phenomenon found Lafayette, they had an epiphany that once enacted, seemed all but obvious. 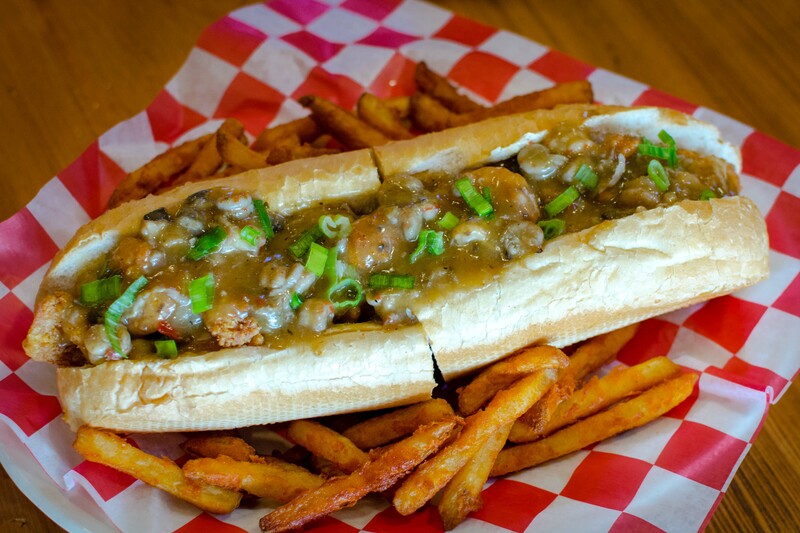 Honest, no frills Cajun plate lunch style food found a mobile home and in October of 2015, The Cajun Table food truck was born. The goal was simple: to bring food and friends together. The food truck set up at local businesses, festivals, food truck rallies, and parks, and at every stop its owners did what they do best: turned a meal into a party. 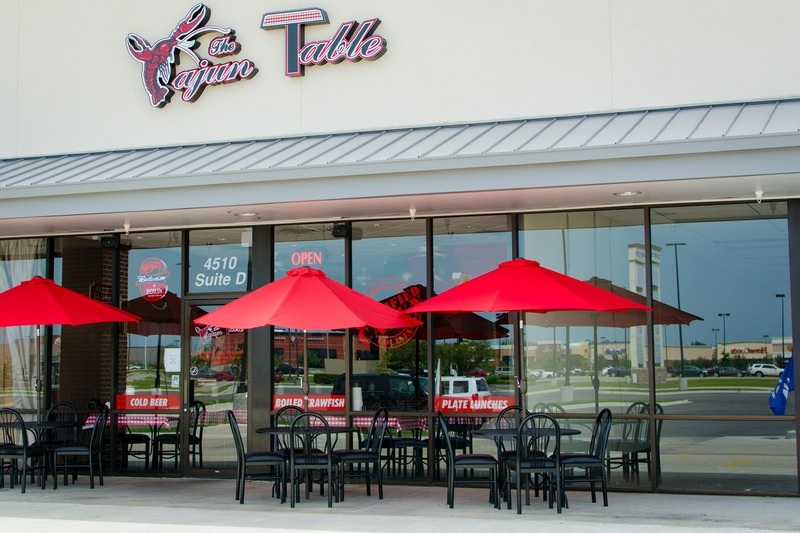 The party continued and on March 1st of this year, The Cajun Table restaurant opened on Ambassador Caffery. 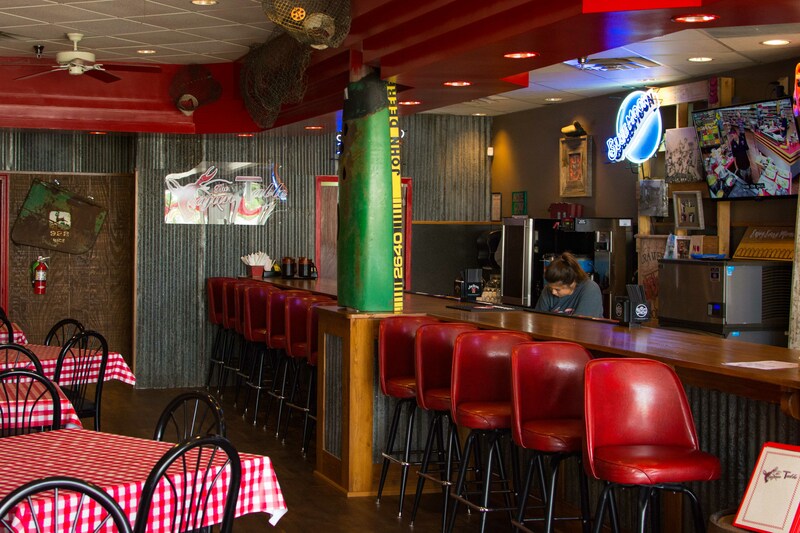 To set the tone, the space is decorated with generations-old family photos and with tractor parts, cypress planks, 100 year old tin, and crawfish traps all from Suire’s Great-Grandpa Gladu’s old shed. The bar was built from cypress and the bottles are displayed on an upright flat bottom boat. It’s a bit of Cow Island in Lafayette, complete with live accordion music in the evenings. 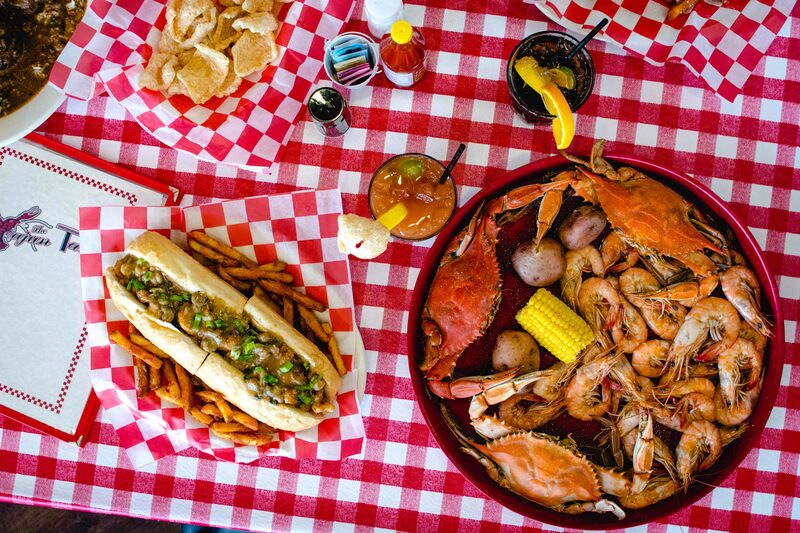 The establishment’s offerings have expanded from the logistical restrictions of a food truck to include boiled crawfish and crabs and a full and vibrant menu of appetizers, salads, and daily specials. Newly seated guests are greeted with freshly fried, house made pork rinds. Menu favorites include the “Pirogue Party Poboy” with “Maw’s Crawfish Dip;” the Saturday plate lunch special: Country Style Pork Ribs and Fresh Sausage Rice and Gravy; and the Fried Catfish Platter. The daily happy hour special is 2 for 1 beer, wine, liquor, and specialty drinks until 6:00, and of course, there’s plenty of boiled crawfish when in season. Three or five pound orders are available. Saturdays are all-you-can-eat crawfish for $24.99 per person. 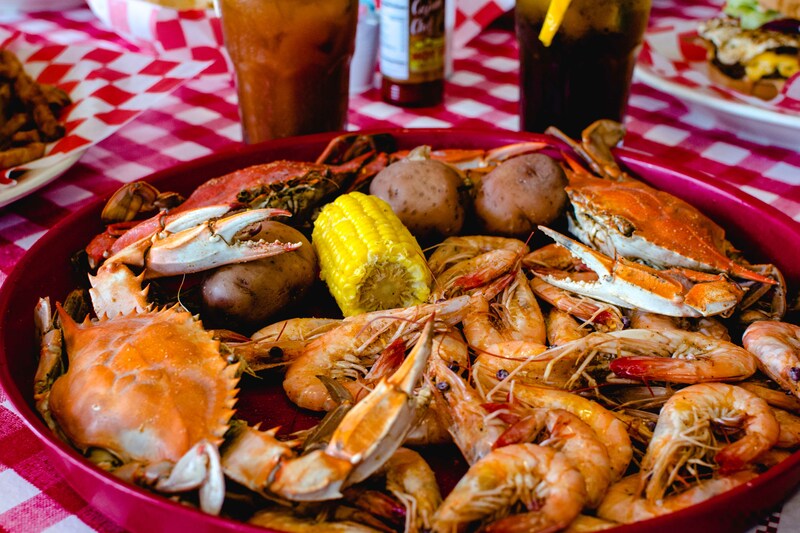 For groups or families, there’s the Half Sack Special: 15 pounds of crawfish with corn, potatoes, and dip; and you can even get the 3/3 Deal: 3 pounds of crawfish and 3 large blue point crabs for $28.99. Suire and Liner acknowledge the hard work involved in operating a restaurant, but they talk about their experience in terms of the joy of treating guests like family and making everyone feel at home. Their goal is to offer something for everyone, and they measure their success with peculiar but telling benchmarks. They note how many of their guests are engaging with each other instead of staring at phones, and how many plate lunch sales are not taken to-go, but instead served to dine-in customers. They relish being introduced to their guests’ out-of-town families, and love the not-so-rare occurrence that a customer will spot one of their own relatives in the old photos on the wall. 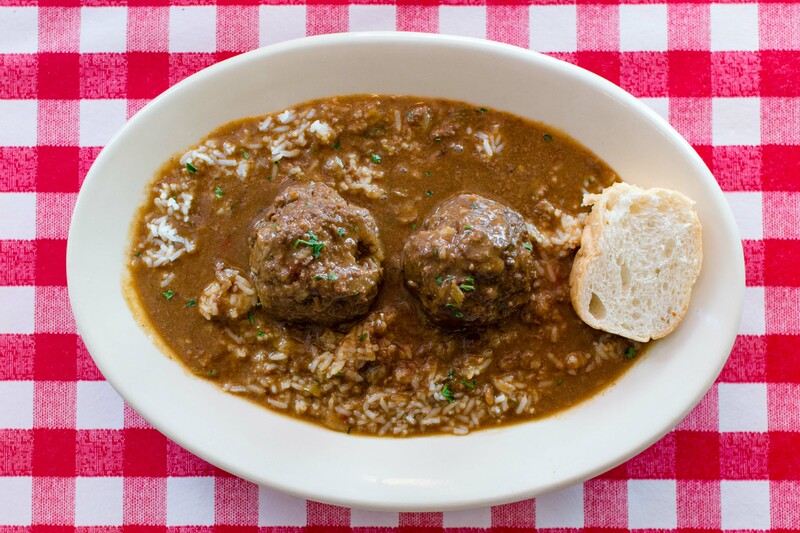 The pair succeeds in serving Cajun food that Cajuns want to eat, reintroducing Lafayette to the Cajun Restaurant. The authentic hospitality and delicious food is 50% Cow Island crawfish farm, 50% Saint Street block party, and 100% home.